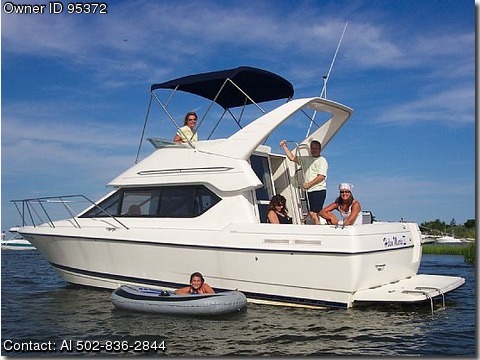 Call Boat Owner Al 502-836-2844. Basic Decription: Price Reduced I'm an 80 year old man living in Louisville, Ky and can not make trips to see my family in New York as often. As it is, I can not even take the boat out by myself. Unfortunately due to these circumstances, I am forced to sell my much loved boat. The details about the boat are as follows - Only eight years of limited use. - Currently located at boat yard in Amityville, Ny. - Annually serviced by boat yard. - Boat is in Excellent Condition. Boat specific information is as follows - Bayliner 288 Classic - Length 30' x Width 10' - Weight 8,090 Lbs - Holds 10 Passengers, Sleeps 6 - Private Head, Complete Gallery Includes Microwave, Stove, Refrigerator, Stainless Steel Sink - Full Command Bridge - GPS CB Radio Included - Engine is a 350 Mag Mercruiser Stern Drive check out link below for even more info httpwww.boattest.comPartnersPartner-Main.aspxlpid354tBOAT-TESTVideoid583p0s Service bill are available upon request. If you have any questions at all concerning this boat, please feel free to contact me at the email provided.